Do you make To-Do Lists? Do they help you keep organized and on track? Me? I’m a list maker. Now and when I worked in the business/banking/finance world. So many things get thrown at me during the day, it is how I manage to stay on track and prioritize. When I worked in the business world, I used the “Task” function on my calendar to help me keep track of when reports were due and other tasks. Today I keep track of things that need to be done around the house and in the Studio on paper and with the “Reminders” and “Notes” apps on my iPhone. I especially like the “Reminders” app for when I have things to do outside the house. 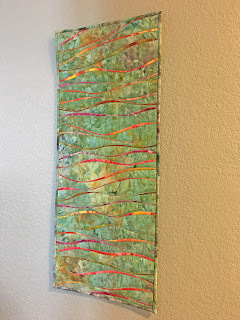 One of the things on my list this weekend has been to hang make the boards I use for my quilts and get Reflections in the Sea hung in the hallway. While I was doing this I thought I would do a tutorial so you can see how I do this. 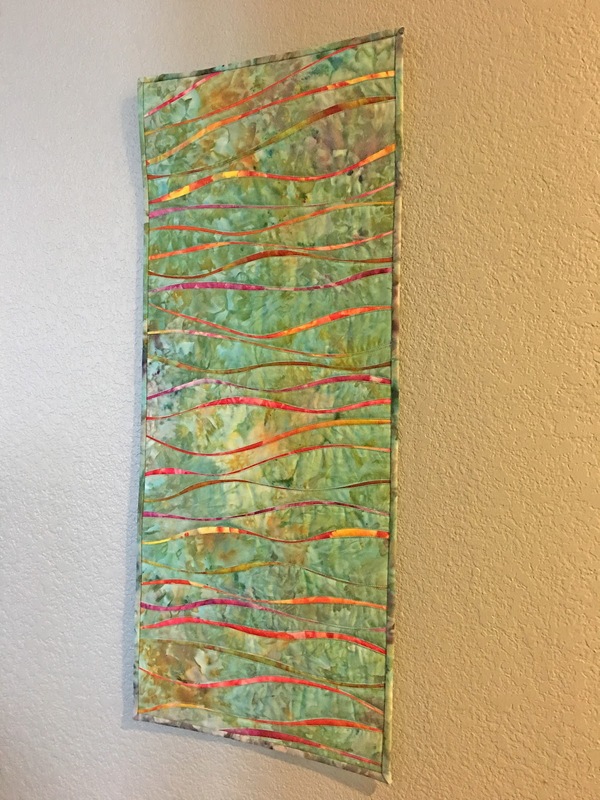 It is a great way to hang quilts at home and at certain gallery showings. I am a member of the Dallas Area FiberArtists and we have our annual show at ThePoint, at C. C. Young in Dallas. This hanging method works great with their system. First I go to the local hardware store and purchase a piece of word ¼” thick and 4” wide. The length varies depending on the width of my quilt. At Home Depot and Lowes have pre-cuts and they will make a few cuts for free, so I had measured what I needed before I went and had them cut the wood for me. When I got home I got out the hangers I had purchased at Hobby Lobby and measured where I needed to screw them in. I place them towards the top of the board so the quilt will hang as close to the wall as possible. Now you will notice in the pictures I used one of the gripper pads under the board so the board doesn’t slip while screwing the board in. Very helpful, you don’t want to be fighting the board while you are trying to get the screw and screwdriver to cooperate. After I screw the hangers in, my husband use to snip off the sharp end and grind it down on the grinder, so it wouldn’t mare the quilt. Well, my sweet friend, Lu Peters, came up with an easier idea of using the felt feet we buy for the bottom of chairs and placing them on the back of the screw. How easy is that! Now, you will notice on my boards, I have written the name of the quilt. I make sure to write this with a Sharpie on the back of the board. You won’t want it showing through the front or heaven forbid, bleeding into the quilt if water hits it. I have so many quilts, writing the name on the board helps when they are at a show or when you are moving. This made it so much easier when we moved last year and I was hanging the quilts in the house. Here is Reflections in the Sea hung in my hallway. I hope you have enjoyed this tutorial. Bookmark it so you can come back to it any time and pass it on to your friends! Follow me on Facebook, Instagram, Pinterest and Twitter! How do you attach the hanging board to the quilt? The board runs through the sleeve on the back of the quilt.